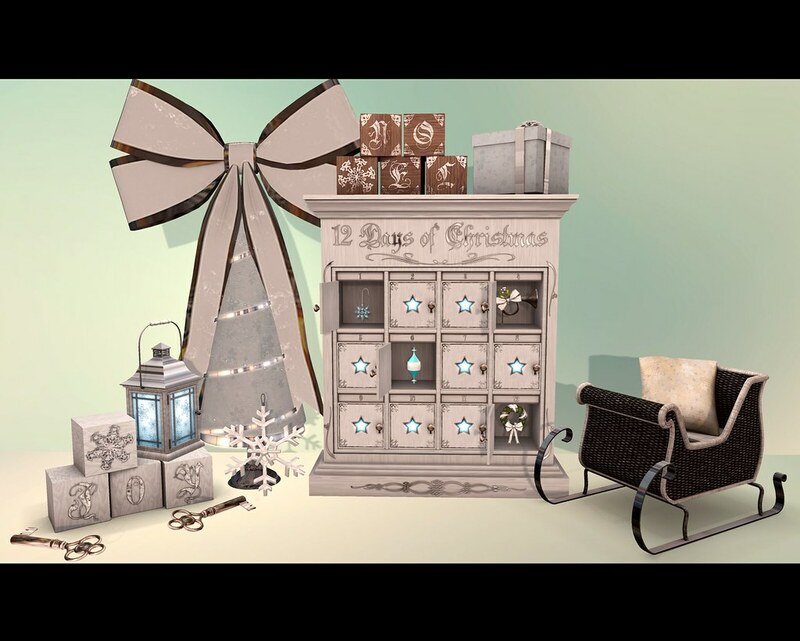 The Arcade Gatcha started yesterday and though usually I try to run away from gatchas it would be impossible to not fall in love for Trompe Loeil items for the event. And not just that: Cory has created the most magnificent and creative gatcha I've ever saw. I'm gonna try to explain how it works: The Advent calendar itself you see below is free and all the doors come closed by default. It's the keys you'll have to collect from the gatcha so you can unlock the doors in order to receive the gifts. There are 12 keys on total. 12 gifts/itens. Each key number will unlock the respective door. You'll have to use the keys you collected to open the doors. How to do that? Simple. In your place/home rez your advent calendar first, then to open each door, collect the keys from the gatcha, it only costs 25L per play. Then to unlock the doors rez on the floor/table each key close to your calendar. Pay attention now cause you'll need to accept the item that the key just unlocked. After the key is used you can still trade it or use as decoration, but you won't be able to open anymore doors with this used key anymore. After that if you take the used key back to your inventory, you'll notice now it will be added 'used' on the object name. And that's it, go on collecting until you have opened all the doors from your calendar. I hope you'll enjoy it just like I did, I really had a blast and the gifts from each door are marvelous I'm thinking about collecting everything again, since you can never have enough christmas decor, especially those from this calendar. Oh also, everything you see below is no copy but it is modifiable and mesh, which is absolutely great since you can play resizing it to be really tiny or super big! Portuguese: O evento 'The Arcade Gatcha' começou ontem e apesar que geralmente eu tento fugir pra bem longe de gatchas seria impossível não se apaixonar pelos itens da Trompe Loeil para o evento. E não só isso! A Cory criou a gacha mais criativa e magnífica que já vi por aí. Eu tentarei explicar como tudo funciona: O calendário advento que você vê acima é de graça, é só pegar onde está a gacha e ele vem fechado. São as chaves que é preciso colecionar para destrancar todas as portas e aí sim receber os presentes. No total são 12 chaves. 12 presentes/itens. Cada chave equivale a uma porta, e destranca só aquela. Para começar a brincar é bem simples: dê rez no calendário no lugar onde você mora, e aí pra abrir cada porta colecione as chaves da gacha, que custam só 25l cada jogada. Aí na hora de destrancar. Dê rez nas chaves que você colecionou perto do calendário, pode ser no chão/mesa, só tem que estar perto. Agora preste atenção já que o item só será oferecido uma única vez, então aceite-o rapidinho. Depois que uma chave é usada ainda dá pra trocar ou usar como decoração, mas já não pode abrir nenhuma outra porta com essa chave usada. Perceba que depois de usada a chave será alterada o nome pra 'used/usada'. E é isso. Comece já a colecionar até que tenha aberto todas as portas pra ter sua coleção completa dos presentes. Eu espero que gostem e se divirtam bastante. Ah, vale lembrar que tudo acima não pode copiar mas é modificável e mesh. O que é perfeito já que dá pra brincar com o tamanho de cada objeto, fazendo ficar super pequenino ou hiper grande!